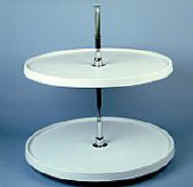 Same features as above but with two independently turning 32" diameter trays. 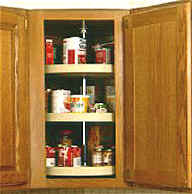 Fits cabinets heights from 24" up to 31". Easy installation. Kit includes two trays, telescoping center shaft (12" upper and 21" lower), top and bottom pivots, and screws. Available in white only. Three 18" diameter trays to maximize your storage in that corner wall cabinet. This three tray set fits cabinet heights from 36" to 42". Shelf heights can be moved on the post by locking screws that allow adjustment. Ribbed tray design provides greater strength and stability. Easy installation. Kit includes three trays, telescoping center shaft, top and bottom pivots, and screws.